It’s a phrase that seems dated when weighed against the techno-rich era in which we live. However, when it comes to app store optimization (ASO) practices and the life we give our apps, it is a phrase that should be taken seriously by app developers and marketers alike. Despite the past year’s peak in data on app store intelligence and productive app marketing practices, CEOs and app designers remain relentlessly impatient, and we can’t blame them. Between Apple’s “5 minutes to 5 days” app review timeline and the seemingly infinite time it takes to procure inbound traffic, it’s easy to lose site of the big picture: Eyeballs are easy, and conversions take time. Here are the lethal ASO mistakes that are preventing you from growing your stream of organic traffic and installs for your app. The way in which Apple and Google index mobile apps in their app stores and how apps are ranked in search results are and always will be private. Nobody, including mobile app marketers, knows how specific app listing elements are weighted in the indexing of apps, or how conversion rates, retention, engagement, and other app-specific metrics impact search rankings. Unfortunately, where there is mystery, there is someone charging for bad information. Despite what the experts tell you, developing app listing strategies through practices such as using Google’s web search data, keyword stuffing app titles, buying ratings and reviews, and other hacks and shortcuts can actually have negative consequences on an app’s success. Apple in particular has been known to increase enforcement on parts of their developer guidelines, especially the ones governing app submissions and app listings. This, of course, has an effect on apps that try to build their business solely off of short-term hacks. The conclusion is simple: No sound shortcut for obtaining high search rankings or conversions exists. Now for the positive: The solution you’re being offered has and will continue to get the job done. ASO provides a competitive, defensible, and long-term position in app stores by connecting an app with its target audience. It is an ongoing effort that produces better ROI than any other app marketing effort. No hacks needed. Keyword stuffing an app title falls under the category of “bad hacks,” whereby the negatives outweigh the positives, even in the short term. Of course, a title like this is bound to show up in a range of search queries, but will these users actually convert? Even if the customer manages to get past the jumbled nonsense, the answer remains: Conversion is highly unlikely. Before Apple began rejecting apps with longer, “spammy” titles, app publishers may have seen a temporary spike in exposure for their app, but with the side effect of low acquisition rates, signaling to Apple that the app was not relevant for the search. App store users have also wised up to the cheap tricks and ploys of app marketers. Keyword-stuffed app titles are huge warning signs to today’s app store visitors that the app is poorly made, or otherwise not of high quality and not worth an install or their time. In the “spammy” example app title above, it’s obvious that the title is not only keyword-stuffed, but detrimental, in that there are no features or benefits listed for the user. Converting users in the app store is, in many ways, the same as running an offline business—you must convince your customers of why your product is the best. Picture yourself as a door-to-door salesman, and you have only 20 seconds to name the two best and most premiere features of your product before the door shuts in your face. Welcome to the App Store. With 1.5 million apps in Apple’s store to date (and that’s not even the largest app marketplace), your ability to convince and convert relies on much more than a couple of old tricks. 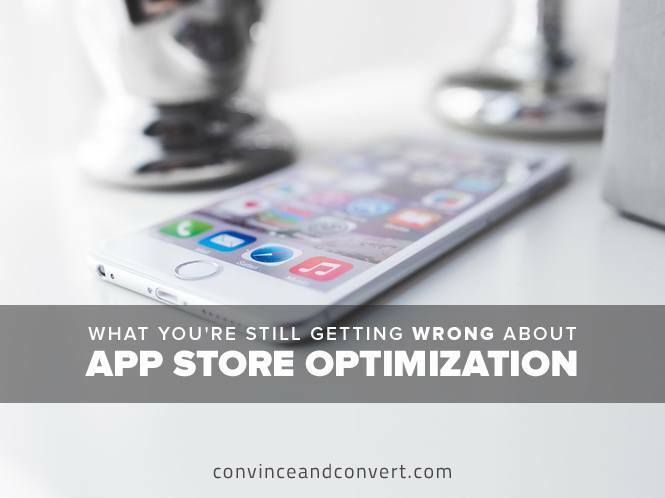 The goal of app store optimization is not to tap into every single person searching the app stores, but rather to cover relevant search terms from your target audience. Studies have shown that around 80% of app store search is feature-based phrases. People searching the app stores are using multiple-word phrases about a feature or function, and they’re looking for an app that solves their specific problem. It is crucial to aim for coverage of relevant feature-based queries by focusing on core features and functions in your app title, keyword field, and descriptions. Finally, remember that the proven methods for how to promote your app have evolved past simply running cost per install (CPI) campaigns. To earn a long-standing position in an app store search rankings, and to tap into the growing stream of organic search traffic, app marketers must commit to proven ASO practices, even if the immediate payoff seems sparse. By skipping the tricks or unproven methods, such as keyword stuffing the app title and buying ratings, you will have created a good foundation for further optimization!